NOTICE: Activation key must be used on a valid Steam account. Requires an internet connection. Early access gameGet instant access and start playing; get involved with this game as it develops.Note: This Early Access game is not complete and may or may not change further. If you are not excited to play this game in its current state, then you should wait to see if the game progresses further in d… evelopment. 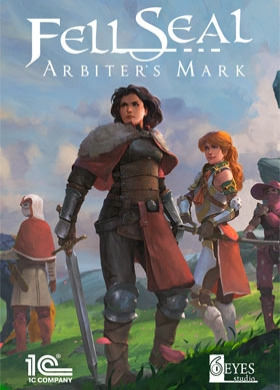 About the game	Fell Seal: Arbiter's Mark is a story-driven, turn-based tactical RPG set in a fantasy world with a touch of steampunk. Take control of the Arbiter Kyrie, an agent of the Immortal Council, tasked with preserving stability and order throughout the land. Select and customize your troops before leading them through rich hand-crafted scenarios to rid the world of deepening corruption.Paying homage to gaming classics, this tactical RPG stands on its own as their worthy successor, bringing a slew of improvements and additions to the tactics genre. Strongly influenced by games such as Final Fantasy Tactics (original and Advance versions) and Tactics Ogre, this tactical RPG stands on its own as a worthy successor of those classics, bringing a slew of improvements and additions to the tactics genre. Story:	Centuries ago, a brutal beast of destruction rent the world asunder. In this time of need, the first Immortals came into their uncanny powers, powers so great that they succeeded in destroying the beast ravaging the land, where all else had failed. To prevent such destruction from ever happening again, the Immortals banded together to form a Council that would enforce order and stability on a global scale, stepping in at any hint of war or chaos. The Immortals might be vastly powerful, but they are few. Even they can't oversee all of the lands. This is why they rely upon their mortal agents, the Arbiters, to guard the land's people from the more day-to-day dangers they face. Arbiters range over the land, rooting out bandits, unruly monsters, and crooked officials; their word is law. But one Arbiter uncovers the deepening corruption pervading her own order, and it falls to her to halt the spread of a threat as dire as the brutal beast of yore. Key features Epic and mature story with over 40 story encounters Classic tactical combat battles, with rugged terrain and elevation Complex class system with over 20 classes and 200 abilities Customizable appearance of troops' visuals from a wide selection Over 240 pieces of equipment to purchase, collect or craft system requirements Windows - Minimum OS: Windows 7 SP1+ Processor: 1.2 Ghz, Pentium 4+ Memory: 2 GB RAM Graphics: DirectX 9.0c compatible with 512 MB DirectX: Version 9.0c Storage: 3 GB available spaceWindows - Recommended OS: Windows 7/8.1/10 Processor: 2+ Ghz Memory: 4 GB RAM Graphics: DirectX 9.0c compatible with 1024MB DirectX: Version 9.0c Storage: 3 GB available space	Mac - Minimum OS: Mac OS X 10.11+ Processor: Yonah family+ Memory: 2 GB RAM Graphics: 512 MB Storage: 3 GB available space	Mac - Recommended OS: Ubuntu 12.04+, SteamOS+ Processor: 1.2 Ghz, Pentium 4+ Memory: 2 GB RAM Graphics: 512 MB Storage: 3 GB available space	© 2018 1C Company. Developed by 6 Eyes Studio LLC. All rights reserved.